Family Lawyer The Bronx: Is It Worth It Get Professional Legal Help? Is It Worth It To Get A Family Lawyer? Is it worth it to hire a lawyer to help you settle family matters? Things like divorce, separation, mediation, and child custody can all be settled outside the courtroom, for the most part. However, can they be settled successfully without lawyers involved? Our answer may surprise you (since we are family lawyers). We do believe you can get away with a successful settlement without needing to hire a lawyer to personally tend to your case. However, in particularly difficult or confusing scenarios, a lawyer can help guide people through the waters. “DIY” is on the rise these days. With the help of the Internet, people all around New York can quickly get the forms and a bit of legal advice they need to settle their family matters without a lawyer. Yes, you can now DIY family legal services! A search on the Internet will lead you to a plethora of resources. Unbundled legal services are offered by professional lawyers who want to make sure people who represent themselves still do it in a fair, legal way. These services are a perfect toolbox of information for people who are respectable and civil toward each other. You should only consider representing yourself if you believe you and your other family members can work together to find a fair solution to the problem. For example, a “DIY Divorce” works best when there are no young children and both spouses can equally divvy up assets so that everyone is satisfied. Marital Settlement Agreement: Also known as a marital separation agreement or a property settlement agreement, this is a written contract that divides property, spells out rights, and settles problems such as alimony and custody. This is not a divorce; however, this settlement can be incorporated into an eventual divorce judgment. New York Divorce: An uncontested divorce is an agreement between two married people that outlines what will happen to all assets, property, and debts after divorce. To file this without legal representation, both parties must be at least 18 years old and have no children under the age of 21. Parenting Plan: This plan is for parents of minor children who want to get divorced, and it will be included in the final divorce decree. It details all rights and responsibilities of both the mother and father, including topics like parenting schedules, residential requirements, decision making, communication, transportation, and dispute resolution. Premarital Agreement: Also known as a prenuptial agreement, this legal document helps two parties identify individual assets and set a precursor for divorce settlement negotiations. Quitclaim Deed: This is a deed of conveyance that can pass any title, interest, or claim that the grantor may have in the property. This does not profess that such title is valid. Essentially, you can partake in any of these legal services if your case will be simple. Each family matter has its own list of special requirements necessary to fulfill before you can represent yourself. For these to be considered legally binding documents and enforceable contracts, they must be executed and witnessed properly. If you’re on the fence about whether you want to hire a lawyer or to do it yourself, you can work with a virtual lawyer in an a-la-carte type format. You’ll choose the documents you need prepared, answer a questionnaire about your case specifically, and a lawyer will create the legal documents you need to move forward. Attorney Diron Rutty can act as your 24/7 virtual lawyer and also give you further legal advice and instructions if needed. A family lawyer is advantageous to people with more complicated cases. First and foremost, in some scenarios, the state of New York will not let you represent yourself. This is usually because there are many complicated variables that need a lawyer’s professional experience to make sure all of the boxes are checked. A family lawyer, in these cases, doesn’t just help you fill out the proper paperwork. More than that, they will help divvy up assets, property, and more so that it is a fair settlement for all parties. This is especially important when children are involved in a divorce. New York greatly cares about its children, so it is imperative that parents create a custody plan that works for the kids and the adults. Ultimately, hiring a lawyer to help settle family matters may be necessary when it comes to presenting your case to the court. 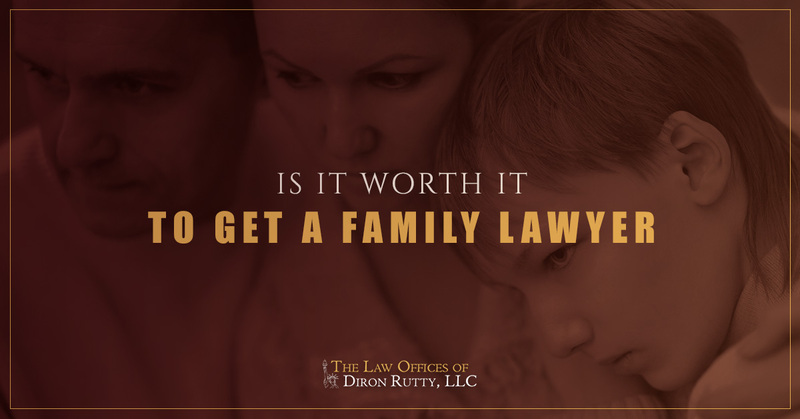 You can save yourself some time by contacting our family lawyer at The Law Offices of Diron Rutty for a quick consultation to determine if you can represent yourself or if you should work with an attorney from the beginning. The lawyers at The Law Offices of Diron Rutty can provide legal representation every step of the way for family-related law matters. Our goal is to help clients resolve their situation peaceably and fairly. We have two offices in the state of New York, one in The Bronx and one in Poughkeepsie. Our attorneys are also available 24/7 online for the unbundled legal services mentioned above. Our team has expertly guided New Yorkers through family law for more than 20 years. Schedule a consultation with us today to learn more about how we can help you. Fill out the form below, or give us a call at either of our offices.